In the previous chapter we examined the mythology surrounding the deity Murugan — his creation, his spiritual maturation, his acquisition of the Vel, and his defeat of the asuric army headed by the demon Surapadman. It specifically noted his adaptation and emblematic role as a quintessentially Tamil deity. As we have observed, the festival of Thaipusam commemorates a specific and determining event in the deity's cosmology, namely Parvati's bestowal of the Vel upon Murugan as the weapon he will use to defeat the asuric army. This chapter will examine the conduct of the festival of Thaipusam at Batu Caves, located outside Kuala Lumpur. While Batu Caves is the major Malaysian centre in which Thaipusam is commemorated, there are other significant pilgrimage sites, both in Peninsular and East Malaysia, where the festival is observed. The first section will trace the founding and development of Batu Caves as Malaysia's foremost Murugan pilgrimage site. It will also detail the current layout of the caves compound. This not only contains the main shrine to Murugan, but also incorporates a number of supplementary temples, an administrative building, a cultural complex including a museum (Muzium) and a gallery, a Tamil school and retail outlets. The following section will explore the overall structure of the festival. This will emphasize the chariot procession from the Sri Maha Mariamman Kovil (temple) to Batu Caves, the ceremonial visit of the deity Murugan to his Batu Caves shrine, the installation of the Golden Vel in his mountaintop temple, and his subsequent return to his main abode in central Kuala Lumpur. The section will emphasize the centrality of the chariot procession and its general linkages to the rituals associated with South Indian kingship. The final section focuses upon the kavadi ritual as one of the defining features of Thaipusam at Batu Caves. Many scholars have pointed out that myths only reveal their potency and inner truths, their “transformative capacity to reveal the ways in which the invisible is enfolded within the visible”, when they are re-enacted within ritual. The previous chapter examined the mythology of Idumban, outlining the legitimating model for the kavadi ritual and highlighting the transformative power of asceticism and yogic disciplines. The large-scale migration of Indians to Malaya throughout the nineteenth century and the first few decades of the twentieth century led to the creation of a distinctively Malaysian Indian society. One of the most conspicuous features of this community is the sharp division between the minority upper classes — the middle, professional and commercial classes — and a majority working class which comprises over eighty per cent of Indian Malaysians. In general it may be claimed that this disjunction has its origins in the differing circumstances of each class's migration to Malaysia. Thus the descendants of “labour” recruitment — those who were contracted under indenture, kangany or other labour schemes, to work in the plantation estate sector or within government utilities — now make up an underclass which continues to fill a range of labouring and unskilled occupations within modern Malaysia. Conversely, the background of the middle and upper classes can generally be traced to “non-labour” migratory streams; that is, their forbears were those Indians who were appointed to clerical and technical positions in colonial Malaya, or who established themselves in professions and business. Most “non-labour” Indians maintain their social distance from “labour” Indians, and in some instances may even deny all bonds of common ethnicity. While the earliest Indian labour throughout the colonial period was furnished by transported convicts, the overwhelming majority of Indian workers who arrived in Malaya between 1840 and 1910 were recruited under a system known as indenture. The colonial preference for South Indian labour was informed by an official perspective which viewed the “Madrassi” as docile and easily managed. Indeed, the supposed “cringingly servile” Tamil was portrayed both as an alternative and as a counterweight to the potentially ambitious and assertive Chinese worker. In his landmark study, K.S. Sandhu estimates that in this period a total of 250,000 indentured labourers were contracted to work in Malaya. These were mainly landless agricultural labourers drawn from the lower and Adi Dravida (Dalit) castes. The British government terminated the recruitment of Indian indentured labour to Malaya in 1910. The deity Murugan has been closely identified with Tamil religiosity for at least two millennia. Descriptions of Murugan are contained within early Tamil literature, including the substantial corpus of Sangam poetry. In his landmark study, The Many Faces of Murukan — The History and Meaning of a South Indian God, Fred W. Clothey points out that throughout the Sangam period Tamil culture progressively absorbed elements of the Sanskrit culture of the Aryan North. The later portrayals of Murugan reflect the admixture of these northern influences and thus differ markedly from those found within the earlier poetry. In the earliest phase of Sangam literature, Murugan is clearly depicted as a rural deity, and is firmly identified with the kurinci tinai (hilly ecozone) of the Tamil country, and hence the tinai's people. The deity is also regarded as the god of the hunt, and indeed Asim Kumar Chatterjee postulates that Murugan may have been the patron god of the Karuvars, or hunting tribes. In this guise, Murugan's enemy is the cur (soor), a demon who ranges the countryside randomly seeking out and possessing young women. In early literature the cur is viewed as an actual physical manifestation whose very presence produces terror. However, over time, the cur transforms into the cura, whom Murugan defeats in battle, initially with a specially shaped leaf, but later with a leaf-shaped lance. Murugan's intense heroism is portrayed in many love poems. He is clearly identified as a god who generates paroxysms of excitement among girls and young women; indeed he becomes established as the patron of premarital love. He is also represented as a deity both adept at creating and dispelling suffering (ananku). The red colour of the god is constantly reiterated, and he is thus known as Ceyon/Seyon (“The Red One”). Murugan is closely associated with the elephant and the peacock, the latter assuming a major role as the deity's mount. Throughout the later Sangam era — a period of urbanization and the establishment of kings in the Tamil country — Murugan incorporates additional roles and motifs. His identity moves beyond the kurinci tinai to gain acceptance in other tinai within the Tamilakam, namely the forests (Mullai), the plains (Marutum), the dry and semi-dry zones (Palai), and the littoral (Neital). The waves of Indian migration which followed the British colonization of Malaya and which continued up until the eve of the Pacific War were accompanied by the re-establishment of Hinduism as a significant minority religion in Malaya. The transplantation and historical evolution of Malaya/ Malaysian Hinduism has occurred in the absence of those traditional points of reference — namely, the religious centres of learning or monastic orders (mathas) which had provided a system of scriptural hermeneutics and exegesis, as well as an influential Brahman or dominant orthodox caste — which had such a marked impact upon Hindu structures, belief systems, mythology and patterns of worship in South India. The new arrivals in the estates and workplaces, lacking wider points of reference, tended to automatically reproduce remembered belief structures, practices and mores of the Hinduism of their home regions. Since the majority of Indian immigrants were either indentured or later kangany recruited labourers, the deities worshipped and the rituals associated with that worship largely revolved around the sub-communal norms of behaviour and caste variations of the village of origin. Over time these practices were in some cases reinforced, in others modified, in many more supplemented, by other regional and caste influences introduced to the estates, workplaces and cities of Malaya. This chapter will provide a general overview of Hinduism as it has evolved in Malaysia. Professor Champakalakshmi has pointed out that religion cannot be isolated as an autonomous domain but must be considered in relation to the specific historical socio-political contexts in which it is implicated. Despite the enduring and formative influences of metropolitan Indian–Malaysian links, and those of more recent intradiaspora exchanges, and many profound resemblances to practices in the Indian “homeland”, Hinduism in Malaysia has followed its own unique trajectory, shaped by the specific historical and other circumstances which attended its importation and adaptation. In seeking to explore Hinduism in Malaysia, I echo Vineeta Sinha's observation that it is necessary to move beyond fixed theoretical models of Hinduism, and in particular established hierarchical pantheonic Sanskritic/non-Sanskritic ranking, and to locate spheres of actual practice. Hindu belief and rituals in Malaysia are astonishingly heterogenous and involve a wide range of imported practices and traditions which have been subsequently moulded by a multitude of localized factors, including region, caste, ethnicity and class. This chapter provides an overview of the commemoration of Thaipusam (or other Murugan-linked festivals) and the related incidence of kavadi worship in a variety of settings, within both metropolitan and diaspora Tamil Hindu societies. In the process it will comprehensively demonstrate that festivals of Thaipusam (or related festivals) honouring the deity Skanda-Murugan, and involving kavadi rituals, are not only widely encountered within Tamil Hindu society but in fact form a central component of the religious identity of Tamil Hindu communities, both within metropolitan India and in the broader Tamil diaspora. The cultural significance of Murugan worship and the related kavadi ritual is particularly emphasized by the examples of Fiji, where bhakti practices clearly demarcate South Indian religiosity against a backdrop of indigenous Fijian and North Indian pressures; of the Seychelles, where the recent construction of a Hindu temple and introduction of kavadi worship have fuelled a Tamil cultural and religious revival; and Medan, Indonesia, where the controversial banning of the kavadi ritual instilled a deep sense of cultural deprivation among Tamil Hindus. A chariot procession organized by the controlling temple or religious body in which the utsava murthi is paraded and displayed to the community over which the deity exercises regnancy. (Only in two of the localities surveyed — the Seychelles and Kataragama, Sri Lanka — is the chariot ritual absent. However, as will be shown, Hindus within the Seychelles have only in recent years inaugurated the commemoration of Thaipusam as a major festival, and the community is still in the process of developing many of the key symbols of Tamil Hinduism. At Kataragama the chariot ritual is replaced by a procession involving Skanda-Murugan in the form of a yantra, that is, a mystical diagram employed to represent aspects of various deities, most commonly sakti powers, and closely identified with healing in Tamil traditions.) The chariot ceremonial is structured around the royal symbolism and kingship (in this context it should be noted that in the Brahman pada yatra described later in this chapter, members of the pilgrimage party bore all the insignia of kingship). While Murugan is typically symbolized by the Vel, his kingship at Palani, and thus in Thaipusam generally, is characterized by the danda, or staff. In the previous chapter we noted that most scholars accept that the developments throughout the period of the great dynasties of South India stamped Tamil Hinduism with characteristics which were to prove both formative and enduring. In order to understand the shape of contemporary reformist impulses within South India, it is necessary to explore the ideologies of British colonial rule in India. These ideologies permeated British scholarship in India and ultimately extended to the subject populations. In the process, “colonial knowledge” profoundly reshaped Indian perceptions of their own culture, society and history, setting in train a series of far-reaching (and in many cases continuing) social and political transformations. India was a timeless, static society whose major institutions — caste, religion, despotic rule — were impervious to change and thus largely immutable. Indian stagnation contrasted with the dynamism and progressivism of Europe. Throughout its entire history, Indian polities had been ruled by theocratic despots (both Hindu and Muslim). This implied that Indians were accustomed to and required the guidance of firm rule. Indeed, the social, cultural and linguistic differences within India inevitably resulted in civil discourse, unrest and conflict, all of which could only be contained by “the strong hand of the British”. All of the civilizations which had invaded and conquered India had declined under the twin impact of the intolerable climate and the inevitable degeneration resulting from miscegenation. It followed that if the British were to survive as rulers they had to remain independent of the degraded races which inhabited India. All knowledge of Indian religious customs and law could be derived from ancient texts. It followed that the investigation of original scriptures would uncover the abiding procedures and principles by which Indian society should be regulated. A corollorary of this thesis was that all of India's problems sprang from deviation from and corruption of pristine Vedic ideals. This perspective insisted upon the primacy of Sanskrit as the sacred language of Hinduism. Most scholars would contend that Common Era India has contained two great and discrete hubs of civilization, each of which served the needs and reflected the aspirations of quite distinct peoples. Burton Stein has termed these hubs “Hindu Aryan India” (centred on the Gangetic Plains/Chambal Basin) and “Hindu Dravidian India” (South India defined as that portion of Peninsular India which falls south of the Karnataka watershed — excluding the modern state of Kerala in the west and the Kistna [Krishna]-Godavari delta in the east). Stein, following other scholars, asserts that the shared social, cultural and political histories of Hindu Dravidian India are such as to constitute it as a recognizable and sufficiently coherent unit for the purposes of study. He identifies the essential acculturating core of this region as the Tamil Plain and its immediate hinterland. While the origins of the South Indian peoples remains speculative, archaeological evidence confirms that the Peninsula has been continually inhabited since very early times. This culture was given distinctive expression through, inter alia, the development of the Tamil language, which comprises one strand of a discrete linguistic family later known as “Dravidian”. The most ancient surviving Tamil writings, located in caves that were once occupied by Jain ascetics, date from the second century BCE and used Devanagari script common among Ashokan inscriptions found in North India. This suggests that even at this early juncture contacts between South India and the Gangetic Plains were well established. South Indian Hinduism has developed its own distinctive societal mores, modes of spiritual inquiry and systems of philosophical speculation. This chapter will provide a general overview of the development of Tamil Hinduism and highlight some of its most enduring institutions and characteristics. This does not make any pretence to be an exhaustive historical survey, nor does it attempt to document all the detailed inflections of the many Hindu traditions and forms of worship located within the Tamil country (Tamilakam). The chapter will demonstrate that the continual reworking of Tamil Hinduism, especially the mutable boundaries of Agamic religion, provided multiple sites of particularistic religious expression, ranging from textual, philosophical and Agamic forms to those whose cosmologies inhere within the context of ritual and which may not recognise the putative authority of Brahmanic Hinduism. "This is an important book by Carl Vadivella Belle which argues that Hinduism and its manifestations in the diaspora has important significance in binding not only the Hindus but also encourages 'others' to revisit Hinduism, especially in a multicultural society like Malaysia which is dominated by communally infused discourses structured upon race and religion." "Dr Belle weaves his magical journey over nearly half a century, offering poignant and potent insights into the socio economic and spiritual realities of Hindus in Malaysia. Numerous books may be available on Tamil Traditions and Hinduism in Malaysia, but none seem to have succinctly and encapsulated the very essence and heart of these veritable subjects. I would unreservedly recommend this book, to all those interested in matters pertaining to Indians and Hinduism in Malaysia." "This is a work of immense inspiration. Combining personal pilgrimage with ethnographic perseverance, it is at once a document of ritual power and cultural change and a biography of religious encounter. By becoming the religious Other, Carl Belle creates a new dimension in the understanding of Thaipusam as both ethnic and individual experience. Dauntlessly frank and insightful, it is without doubt a rare achievement." My first experience of Thaipusam occurred on 24 January 1978. Encouraged by Indian contacts who suggested that the festival might be of some general interest, I rose at 4 a.m., and accompanied by my wife, Wendy, four visitors from Australia, and a young Tamil man who had agreed to act as our guide, we made our way to Batu Caves, about thirteen kilometres north of Kuala Lumpur. Despite the early hour the area around the caves was already crowded and we had to park some distance from the main site. (Press reports calculated the 1978 attendance at 500,000 and I was later to find that many people had spent the night at the caves.) We threaded our way through the concourse to the very foot of the steps leading to the main cave (known as the Temple Cave), which would, we hoped, provide us with a privileged view of the festival and its participants. Since our arrival in Malaysia we had been fed a diet of highly dramatic (some might say sensationalist) stories of the Thaipusam festival. We had heard accounts of the numerous kavadi (ritual burden) bearers, their bodies pierced with skewers and hooks, carrying their loads up the sharp incline of the stairway leading to the main shrine within the Temple Cave; of the immense crowds; of the auditory overload, consisting of the chants and shouts of devotees, the constant drumming, the loudspeakers relaying amplified religious music as well as the droning speeches of visiting political dignitaries. And this festival was dedicated to the deity Murugan, a South Indian god so seemingly obscure and generally unknown that he earned but a brief paragraph in one of the putatively authoritative texts which had provided my background reading into Hinduism, and no entries at all in the remainder. Most of what we had heard about Thaipusam had comprised the impressions of the few expatriates who had visited the festival, and who tended to view it as a curiosity, a form of local colour, an incidental divertissement which provided a suitable touch of the “mysterious East” to round out their stay in “oriental” Malaysia. This chapter will explore the kavadi ritual at Thaipusam through the structures of the Tamil Hindu pilgrimage ritual. This will examine theoretical notions of pilgrimage and the implications for the individual participant. The chapter will also investigate how Hindu ritual performs its work, and how it enables the devotee to affect a paradigm shift in the circumstances of his/her mundane existence through an appeal to and interaction with the Divine. This process involves substantial modification and transformation, which must be undertaken at a ritually propitious moment. At Thaipusam this follows the installation of the king-deity Murugan in his mountaintop palace, and his consequent readiness to grant audience to his devotees. The chapter looks at asceticism and change, the liminality of trance and its application as an agent of transformation at Thaipusam, and the multivalent symbology of the journey to the caves. Finally, this chapter makes reference to the Idumban puja, in which the devotee is restored to society, as well as the heat–colour paradigm. A phase of separation in which the devotee withdraws from mundane routines into “sacred time” (that is, time outside the quotidian) and embarks upon a period of preparation for the main phase of the ritual. A transformative phase in which the individual is in a state of “betwixt and between”. Victor Turner has famously described this phase as that of liminality, a period in which the receptive devotee, freed from the mundane, experiences new perceptions of reality and in which the mind will “proliferate new structures, new symbols, new metaphors”. A reincorporative phase in which the individual, newly transmuted, is returned to quotidian routines. 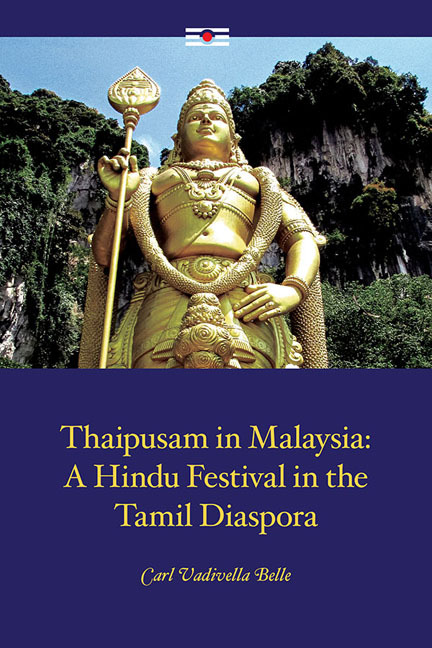 In the Introduction I argued that many scholars who had written about Thaipusam in Malaysia had constructed interpretations of the festival and the associated forms of worship (especially the kavadi ritual) which suggested their own rationales for Thaipusam. It was contended that each of these analyses was superficially convincing, but when subject to close examination relied upon ethnographies that were far from complete. In treating Thaipusam as sui generis, these scholars had failed to situate either the festival or the kavadi ritual within a sufficiently broad cultural or comparative framework. The main objective of this study has been to closely examine Thaipusam from the “inside”, as it were, and to trace the layers of meaning and the recondite vocabularies of this multifaceted and complex festival in terms of its continuing relevance to Malaysian Hindus. In the following paragraphs I will conclude that Thaipusam at Batu Caves, far from being a cultural aberration, a product of time, place and the peculiar circumstances of Hindu Malaysians, is constructed from deep-rooted elements of South Indian culture, and can only be fully comprehended by locating it within Tamil history, philosophies and belief structures, and in particular those associated with the Tamil deity Murugan. The Indian population in Malaysia can be traced to two major streams of migration; namely, those recruited to serve as a labour force within the colonial economy, and a minority of technical, professional and business migrants attracted by the economic opportunities offered in British Malaya. Labour recruitment produced a variegated population consisting of the general spread of castes below the Brahman level. Skilled and professional migrants included an influential Chettiar merchant/moneylending class, Jaffna Tamils, as well as Malayalees, North Indians, Sikhs and professional and artisan Tamils. The Indian population was characterized by a clear social and vocational chasm between the middle-upper class and the labour force, the former dedicated to maintaining their distance from the despised “coolies”. The social divisions between middle-upper class and working Indians established by the conditions of colonial labour and non-labour migration remain as fixed and potent in contemporary Malaysia as they were in pre-war Malaya. Since Merdeka, Indian political social and economic weaknesses have been repeatedly exposed, especially in the period following the implementation of post-1969 economic, educational and cultural policies designed to increase social and economic opportunities for Malays. It is for good reason that many academic studies of Indonesia centre on the nation-state. Historically, as Benedict Anderson (1990:41-5) explains, in the Indonesia/Malay world the term negari designates both a capital city and a kingdom, reflecting centuries of empires and statehood in the region. Since World War II and the period of decolonisation, arguably the first major phase of the Indonesian state ran from Independence through Guided Democracy, the downfall of Soekarno and the horrendous killings of suspected communists. The second phase was the 32 year reign (1966-1998) of President Soeharto and his New Order government, in which the state party Golkar exercised control over the state, and in its development drive implemented repressive measures over the wider society. Appeals to national culture were both widespread and diverse in their sources and aims during this period. By 1997 the Reformasi movement had begun to gain momentum, signalling the beginnings of a third phase in the history of modern Indonesia. Following the toppling of Soeharto as President in 1998, the legitimacy of the Indonesian nation-state was challenged on many fronts. Economic collapses that preceded and were not resolved by Soeharto's downfall further exacerbated intergroup and interpersonal sensitivities, not least in Javanese cities hit heavily by unemployment. Concerns over the integrity of the nation-state were also acute, with East Timor gaining independence from Indonesia, and powerful groups in numerous provinces seeking autonomy or independence. Added to these were long-term issues concerning roles of Islam and the Military in state affairs. When I was conducting fieldwork, the brilliant and worldly yet administratively challenged President Abdurrahman Wahid (Gus Dur) underwent a protracted impeachment process. Major shifts were underway in local government, and protests over labour issues and fuel oil prices were commonplace. Despite these major political and economic crises and heightened inter-group sensitivities, as well as growing links with international terrorism, Indonesia had a great deal of success in adjusting to a new era, notably in areas of regional autonomy, press freedoms, legal reforms, and the democratic election process more broadly.